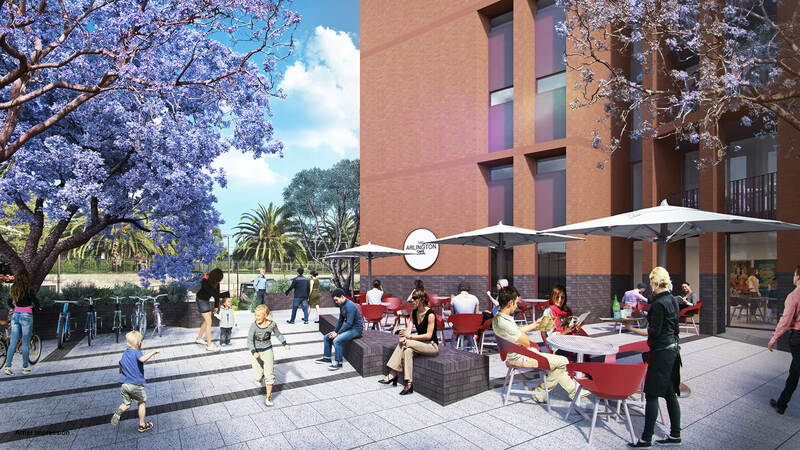 Arlington Grove is a carefully curated blend of expert landscaping with modern architecture, featuring an orange grove corridor — a tribute to the site’s cultural heritage. Arlington Grove bears the mark of considered planning, with a focus on sustainability, community, and connectivity. Property developers Galileo Group pioneered this project, bringing years of expertise and a successful track record of developing large-scale projects. In a market inundated with high-rise, high-density living accommodations, the teams behind this project are actively working against the norm. These residences are separated into four individual buildings, two with only four levels and two with eight. 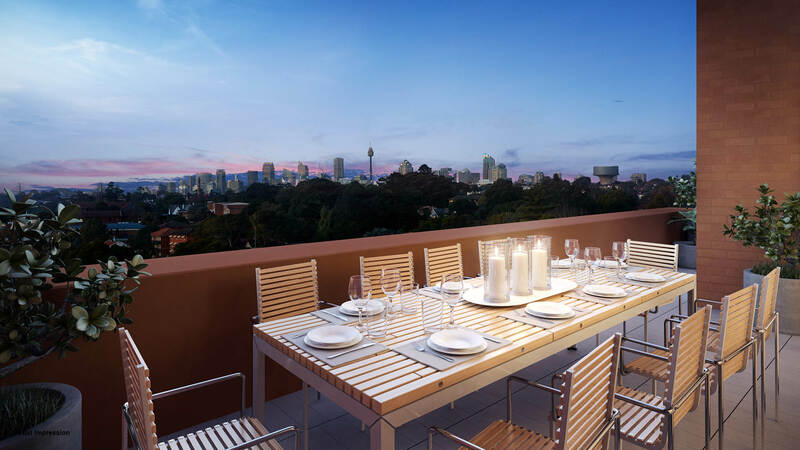 Because of this, each of these new apartments, available in 1, 2 and 3 bedroom configurations, balances intimacy and privacy with Dulwich Hill’s expansive, leafy surrounds. Innovative architectural structures frame the glass exteriors of each building. Blades of brick and steel rise from the facade to create relief from the glare of Sydney’s sun, and coarsely grained, warm and richly textured brickwork with a warm, rich texture marries this modern feature to its natural surrounds. Generously sized balconies create a seamless transition from the outdoor spaces to light-filled interiors. An abundance of natural light flows through the full-height sliding glass doors, highlighting timber flooring and high ceilings. When open, these doors combine with considered apartment configurations to allow warm Sydney breezes to drift through the living spaces. Arlington Grove showcases timeless yet modern architecture and homes with classic and elegant interiors, but the impressive brilliance of the teams behind the project doesn’t stop there. Emphasising the importance of sustainability, the development features a community garden. Residents can gather and connect in this space while planting vegetables or picking herbs. It’s the perfect place for children to learn about the environment under the guidance of parents. With state of the art barbecue facilities and a centrally located Residents’ Room, it’s all about amenity at Arlington Grove. Weekends will feel like a glorious retreat from the every day when residents gather together or practise grill master skills with friends and family. Those who work in the city will find these homes are conveniently connected. 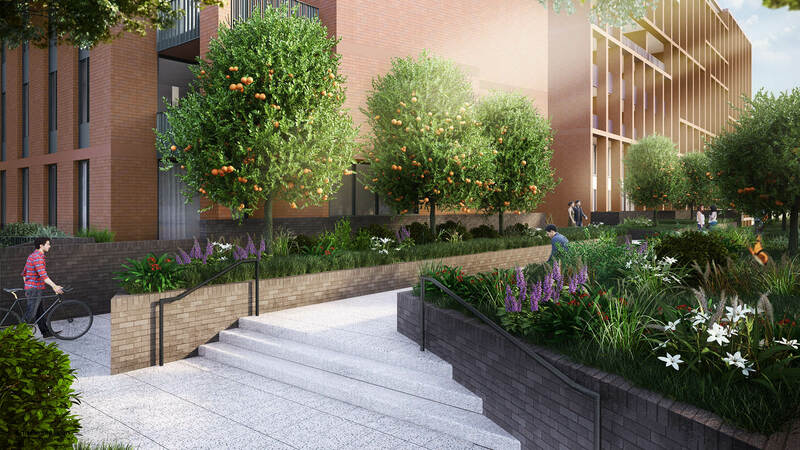 Walk through Grove Street, under the shade of the orange trees lined either side, and up towards Arlington Square — a landscaped gathering place with the potential for an onsite cafe. On the other side of the street lies the Arlington light rail station, providing access to the city in around half an hour. Here in Dulwich Hill, though, there may be no need for daily travel to the city. 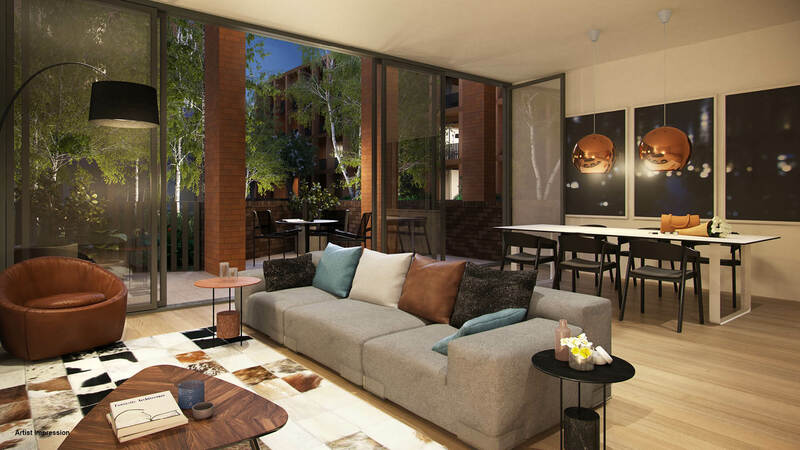 With access to the amenities on offer in the Dulwich Hill village and the Marrickville hub nearby, residents will find everything they need is at their fingertips. Highly regarded primary and secondary schools, both private and public, are within a short drive or a leisurely stroll, making these homes ideal for families. After school, parents can take children to visit the Johnson Park on the way home. With two playgrounds, lush grassed lawns perfect for picnics, and a basketball court and skate park, Johnson Park is a great place for families to gather and enjoy an idyllic Sydney afternoon. Named after orange varieties, each building at Arlington Grove contains residences that offer an oasis-styled retreat. Access the best of community living while retaining that important sense of privacy at these immaculately designed homes in Dulwich Hill. Enquire here to find out more about Arlington Grove in Dulwich Hill, NSW.